1. Parallel Burdens: No question of values can be determined entirely true or false. This is why the resolution is debatable. Therefore neither debater should be held to a standard of absolute proof. No debater can realistically be expected to prove complete validity or invalidity of the resolution. The better debater is the one who, on the whole, proves his/her side of the resolution more valid as a general principle. 􀀃 Burden of proof: Each debater has the equal burden to prove the validity of his/her side of the resolution as a general principle. As the resolution is a statement of value, there is no presumption for either side. 􀀃 Burden of clash: After a case is presented, neither debater should be rewarded for presenting a speech completely unrelated to the arguments of his/her opponent. 􀀃 Resolutional burden: The debaters are equally obligated to focus the debate on the central questions of the resolution, not whether the resolution itself is worthy of debate. Because the affirmative must uphold the resolution, the negative must also argue the resolution as presented. 􀀃 Definitions: The affirmative should offer definitions, be they dictionary or contextual, that provides a reasonable ground for debate. The negative has the option to challenge these definitions and to offer counter-definitions. 􀀃 Value Premise/Core Value: A value is an ideal held by individuals, societies, governments, etc. that serves as the highest goal to be protected, respected, maximized, advanced, or achieved. In general, the debater will establish a value which focuses the central questions of the resolution and will serve as a foundation for argumentation. 􀀁 explain how the value should be protected, respected, maximized, advanced, or achieved. 􀀁 measure whether an argument protects, respects, maximizes, advances, or achieves the value. 􀀁 evaluate the relevance and importance of an argument in the context of the round. The relationship between the value premise and the criterion should be clearly articulated. During the debate, the debaters may argue the validity or priority of the two value structures. They may accept their opponent’s value structure, prove the superiority of their own value structure, or synthesize the two. 4. Cross-Examination: Questioning should clarify, challenge, and/or advance arguments in the round. 􀀃 Written: Cases and arguments should be constructed in a manner that is organized, accessible, and informative to the listener. The debater should employ clear logic and analysis supported by topical research. 􀀃 Verbal: The debater has the obligation to be clear, audible and comprehensible, and to speak persuasively to the listeners. Additionally, debaters should strive for fluency, expressiveness, effective word choice, and eloquence. 􀀃 Non-verbal: The debater should demonstrate an effective use of gestures, eye contact, and posture. Throughout a round, debaters should demonstrate civility as well as a professional demeanor and style of delivery. 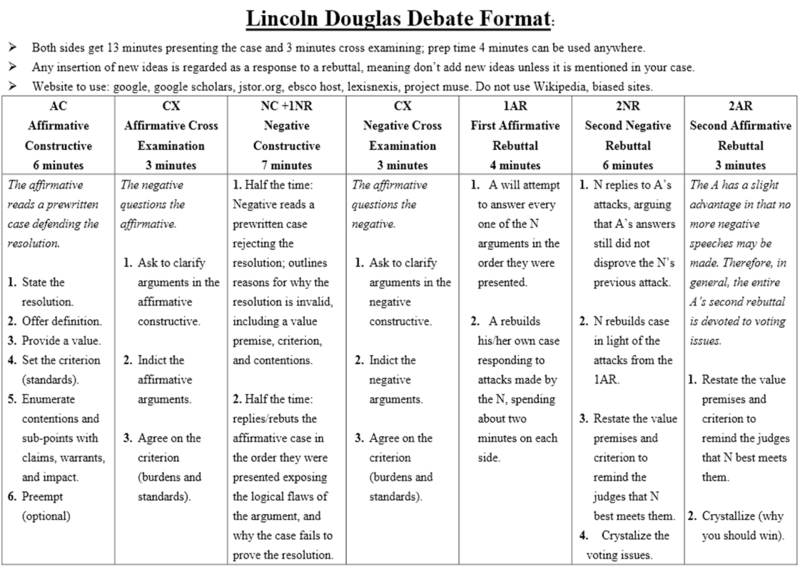 Lincoln-Douglas Debate teaches critical thinking and public presentation skills. Your role as a judge is to determine which debater did a better job of convincing you that his/her side of the resolution more valid as a general principle. 1. Before the Round – Find out the exact wording of the debate resolution and write it down. 2. To Begin the Round – You will be instructed as to which side the debaters have been assigned. a. The Affirmative debater should be listed on the left side of the ballot and you may ask the debater to sit on the left side of the room as you, the judge, look at the debaters. b. The Negative debater should be listed on the right side of the ballot and you may ask the debater to sit on the right side of the room as you, the judge, look at the debaters. c. Record each debater’s code and side. You can confirm this information with the debaters. d. When both debaters are ready, the Affirmative debater will stand in the front of the room to deliver the initial speech. a. While the debaters may keep track of their own time, judges need to monitor speaking times during the round. Speech times and order are listed on the ballot. b. Each debater has five minutes of preparation time (total) in each round, which can be used prior to any of that debater’s speeches or cross-examination period. Judges need to monitor how much preparation time has elapsed for each debater. c. You are encouraged to take note of arguments made to assist you in making your decision at the end. d. Keep track of what a debater says, if anything, in response to the other debater’s arguments. To ensure fairness, your notes should help you determine if a debater is improperly making brand new arguments in the final rebuttal speeches to which the opposing debater has no opportunity to respond. e. Judges should not ask questions during the round. a. Check your codes carefully. This is especially important when marking the winner of the debate. b. In your written comments, please be as constructive and educational as possible. Provide a detailed justification of your decision, referring to the central issues the debaters presented in the round. Evaluate the round based only on the arguments that the debaters made and not on personal opinions or on arguments that you would have made. 􀀁 Personal bias: A judge’s preference for a side of the resolution or a topic bias should not enter into the decision. A judge must decide the round based on the arguments presented in that round. Objectivity is the primary responsibility of any judge. 􀀁 New arguments introduced in rebuttals: The judges shall disregard new arguments introduced in the rebuttals. This does not include the introduction of new evidence in support of points already advanced or the answering of arguments introduced by opponents. 􀀁 Burden of proof: Which debater has proven his/her side of the resolution more valid as a general principle by the end of the round? No debater can realistically be expected to prove complete validity or invalidity of the resolution. A judge should prefer quality and depth of argumentation to mere quantity of argumentation. A judge should base the decision on which debater more effectively resolved the central questions of the resolution rather than on insignificant dropped arguments. support? Which debater best utilized cross-examination to clarify, challenge, or advance arguments? 􀀁 Resolutionality: Which debater best addressed the central questions of the resolution? 􀀁 Clash: Which debater best showed the ability to both attack his/her opponent’s case and to defend his/her own? 􀀁 Delivery: Which debater communicated in a more persuasive, clear, and professional manner? A judge should give weight only to those arguments that were presented in a manner that was clear and understandable to him or her as a judge.